Hi! First of all thanks a lot for the great design! So much looking forward to putting it in my printer. I printed your Front Brace, which fits perfectly in the printer, and now I printed this one. However I have noticed that the holes for the threaded rods don't match the ones of the Front brace, please see attached pictures. It feels like ~2mm off. How can that be? I printed one after the other so the printer should be in the same condition. I also made sure it was scaled to 100%. Other dimensions (like height) match perfectly. If I try to install this, the rods will bent, right? I have a picture posted of the dimension from hole to hole. If your distance differs then your scale is off and it will not fit. The front and rear braces have the same hole to hole distance. I double-checked in Cura that the scale is 100% in all directions. As I said the Z dimensions for example are 100% accurate, and the total length of 260mm is around 259mm, which seems within tolerances. However I don't understand why the ~2mm offset between holes... Is there anything else I can check in Cura? I just checked the file and it is correct. I have no clue as to why your print is so far off. Tightened the belts and printed again - now the sizes match perfectly! Wow, who would have that of that. Great news. When putting 12mm more does not fit in the printer could you pass me the version without the 12mm? OK, this I don't understand. What 12mm...? Send me your email to [email protected] as I don't want to put this public. Super !! fits 100% like front brace,thanks !!!!! hi, can you tell me the approx time this and the front brace are supposed to take when printing? is it supposed to be 10 hours for the back brace? Oh my, it's been a long time since printing these but if I recall I think it was about 5 - 6 hours. Oof. I got 10 hrs with almost all the default settings in Cura and cubic 20% infill. How exactly can I bring that time down without sacrificing quality? e.g. by setting print speed to 50 m/s, out layer to 15 m/s and infill 60 m/s. Okay, thanks. Will try those once I get home. edit: so, by using 100mm/s and the other speeds calculated off that (besides some changes), I got 7 hours. No idea how you pulled out 5-6. OK i have a weird problem. The slots for the threaded rods don't seem deep enough. When I install the brace, it lifts the entire frame up off the table. From the table the printer is sitting on to the top of my threaded rods is ~18mm which seems a lot lower than the slot in the brace design. Do I have some weird knockoff A8 or something? I printed 100% with Cura, but the housing for the threaded rods do not fit! the support is longer! One question though, would it be possible to modify it with screw holes so I can use it to secure my machine to a base? I am not sure if I can modify STL files, but it would be really useful! Have you checked the remixes? I didn't even know that was a thing. I'm brand new to this game! But yeah, looks like there's one there with screw holes! Wish I had seen that 7 hours ago! Anyway, I'll probably just try drilling mine. Or making an insert for the triangular holes. Anyway, you make amazing mods, thank you very much! Those alternatives will work too. Awesome model, printing it out now. I have also printed your front brace and they all worked out great, keep up the good work! Thank you for this post. It fits really well on my A8 and does the job of keeping my acrylic from bending due to tension on the belt. It works on my new Anet A8 that I just got a 4 days ago. compatible whit anet a8 version may 2017 ?? Yes, it works on all Anet A8 printers. According to Cura it won't fit on the build plate. How do i print this? I have the same problem! There are 2 solutions i can think of: 1: rotate the print so it goes across the buildplate diagonally, or use meshmixer or other stl editers to cut it in half and print them separately. C'mon people.... it clearly shows in the pictures section how to place the print on the build plate. Otherwise you don't have your slicer set up correctly. This will not fit on the new anet a8. The horn on the rear part is hitting the y-axis brace/stepper motor. My Anet A8 os only 3 weeks old. I too have a problem where I cannot slide it under without the horn hitting the stepper motor. Do I have to sand the part? As can be seen in the pictures your rear acrylic frame is already quite bent. First thing is to completely loosen the toothed belt. Then slid the frame brace in place while CAREFULLY bending the rear acrylic frame until the horn fits the stepper motor frame piece. Will upload tomorrow after i finished my on going print. I'll try this because I noticed that if I tried to tensión the bed belt the rear frame bended very easily! so I wish this will make the difference! Thanks! It is a must. The front brace is needed as well! I accidentally printed the bigger one first, I didn't realize my mistake until I started to read all the comments. Maybe that one could be renamed so it is easier to distinguish which to use (in my browser the filenames are too long to see the differences). But other than that, thanks for these. I have the front brace on and the correct rear brace printing. I've removed the file all together as you are not the only one with the mishap. The longer frame brace is now available on the project page. Good idea. I have since printed and fitted the correct one. Thanks again for these parts. How did you print it? Tried several times. Played with hotend and heatbed temperature, but have always warping problems at one side. Buessel have you tried to print over the hot bed, without glass? 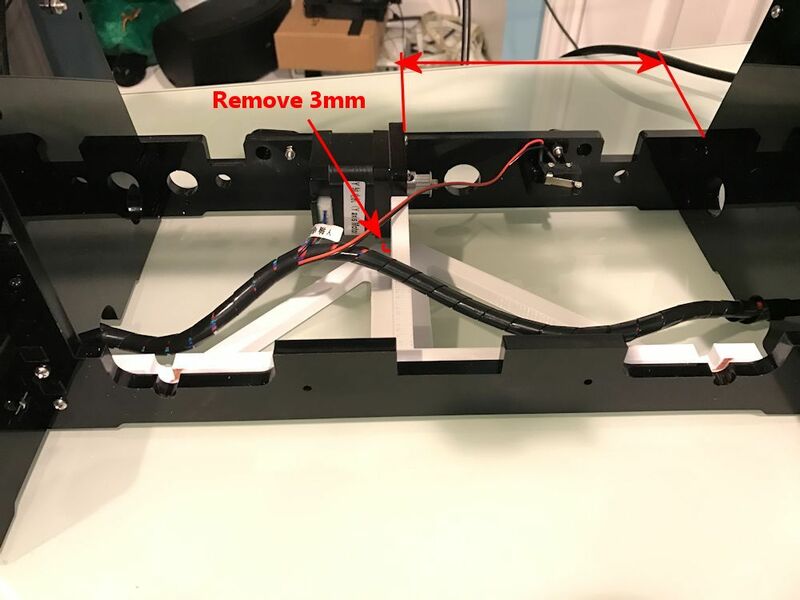 Just painting tape (I don't know how to say it in english), it will reduce the heat loss in the bed to avoid warping and check that the printer is well sitted flat, if needed use clamps to assure it to the ground (or table) and recheck the leveling of the bed, the 2 vertical mountings ( yx axis?) because very small imprecissions will make the warping more able to occur! Successfully printed and fits like a glove - along with the front brace, I can finally tension my Y appropriately without the belt teeth clicking! A note for people having difficulty mounting this because the brace is too deep (not enough room for the Y motor housing to slide in): I had this problem initially, but then I loosened my rear plate nuts which were slightly buckling the acrylic. The part immediately slotted in nicely and I was able to retighten the nuts easily. EDIT: Meant to say - thanks very much Leo, great mods. Just giving a heads up with my experience: V2.0 had too large of a gap both in the floor slot and in distance to the motor wall to prevent twisting of the frame. The original version (non V2.0 included in the downloaded files) fits almost perfectly. The floor gap is a tight fit on the motor wall helping preventing twisting, but the main vertical brace for the motor wall still has a paper thin gap allowing for some play/deformation in the acrylic frame. The original version of the brace also required removing some plastic as it doesn't have the nice curve of V2.0 thus crashing into the y-belt clamps. Thank you for the design, it's still a great improvement over other braces I've tried! The small floor gap is necessary because the tolerances of each built printer are too great. Too many "complaints" forced me to change the width. However the change has no negative effects. The slot could have just as well been left out as the upper support for the motor wall will prevent any major twisting. The original version was removed from the files section some time ago. Ah, I must have copied V2 into the folder of the original version. V2 seems like a no-go for my machine. At the same belt tightness, the larger gap in the floor of V2 resulted in significant twisting in the motor wall (>5 degrees) compared to the original version which was minimal (1-2 degrees at most). I'd like to see some pictures please. You can send them to [email protected] if you like. Most likely due to tolerances of the acrylic frame pieces or the frame pieces might be bent outwards. It doesn't matter. Install the rear frame brace (and also a front framer brace) and tighten the toothed belt. The acrylic frame part will lean on the frame brace accordingly. You probably printed the wrong version. Read the "Summary" for details. I've uploaded V2.0 which solves the problem of different rear frame dimensions. Users that have have modified there h-carriage mount can now also use this frame brace. In your case you would need to print out "Anet_A8_Frame_Brace_Rear_V2.0_Leo_N.stl". Thank you Leo, this and the front brace make a great addition to my printer.. The front brace I should have printed as soon as I received my printer, or a belt tension device, yours did both in one application.. thank you again.. I printed this out and it looked great, then I started to place it in the frame and realized it wouldn't fit. It fit width wise where the rods go, but depth wise it was far to long. Can't quite figure out why it printed that way either. Most likely your rear acrylic frame is heavily bent. Another user had the same problem. I'll take a picture tomorrow. I'm not sure that's a problem, it's a brand new printer and I'm guessing it's about an inch or more to long. It actually just looks longer than the ones in the pictures everyone's made as well. If the width wasn't correct I might have assumed my printer, but I have brand new fiber reinforced belts with tensioners installed as well. Thanks for the speedy reply. Thx Leo for all your hard work on the A8 upgrades. I printed and installed the front brace with no problem but for some reason I can't get the back brace to fit in Cura no matter which way I turn it. Do you have any suggestion? Again thx for all you do! To make sure the file on Thingiverse server didn't become corrupt I downloaded and loaded it up with Repetier-Host (Cura). Set the object @ 45° angle and make sure the size is set to 100%! I added a brim and it sliced as expected. Thx Leo for the response. I can't figure out what's going on. I re-downloaded the file again and the same thing happens. Just to see if I could figure out what was going on I downloaded the front brace again and it rotates and fits in Cura fine. If you happen to think of anything else to try let me know. Thx again. Picture would help because I don't understand the problem. I had an issue too, seems the nose of the frame is too long for the brace. I will attempt to take pictures and post. I think the design of the frame has changed. I'm new at this - what should I set the Infill Density to in Cura - is the default value of 20% ok or does it need to be increased? No problem. In general always use what the designer recommends. In this case 20%. Hi, i just installed your front and back brace, front fits like a charm, but for the rear brace, i had to print out v2.0, because 2.02 is too large, allthough i bought my a8 very recently. I don't have a version 2.02. Which one do you mean exactly? I´ve been using your brace for quite a while and it has been working great. However, now I have modified my printer to use a longer heatbed (http://www.thingiverse.com/thing:2251940), so it was necessary to set the rear plate back by 25mm. As a result, the brace doesn´t fit anymore. I have made a temporary fix by using an extra set of nuts and washers for the brace alone, but it would be better to have it directly against the middle plate. Would there be any possibility to make a version of your brace stretched by 25mm? Yes, that can be done. I'll let you know when I'm finished. File uploaded. Please print ASAP so we are sure it works. Thanks a lot, that was quick! I´ll print it tonight or tomorrow and let you know how it fits. Hi there. I really like the design but the brace is too short. From the middle brace to the back plate where the stepper brace is 91mm. The model it 88mm. I have picts I can send over if it helps. Vom Design her gefällt mir das ganze sehr gut. Allerdings habe ich nun ein Problem: Mit verbauter Front- und Back-Bracket hebt sich mit der Riemenspannung der vordere Teil (in etwa wie bei einer Wippe). Hat das schon mal wer beobachtet? I also tested the version 2.0 and it fits perfectly! I bought my printer a month ago and the distance was 160mm as well. Version 2 is universal. It should fit both 156mm and 160mm rear frames. Please let me know if V2 works. I cut it down in tinkercad to only the part with the grooves and am printing that out. Was having a heck of a time getting my auto level setup working properly and just realized that because I had the wires for the sensor in the same loom as all the other wires for the extruder the signal was getting noise. Anywho, that is fixed and it is printing now. I'll let you know how it goes. Looks like it will fit. Unfortunately I have a lot of fine tuning to do with my auto leveling sensor to be able to print to the extreme edges like this will require. Hopefully I will get that squared away tonight / tomorrow. Thanks again for making those changes! To this day I've gotten no confirmation that the manufacturer changed the design of the frame. I can confirm that the spot you asked to measure in that image is indeed 160 mm on my frame and I purchase my printer just 3 weeks ago. I love all your other designs and would like to help get this design to work for the frame I have. Is this built in a manner that I could manipulate it with SketchUp or another free program to make it work? Not sure if this helps but here are some measurements. It looks like it is closer to 158 or 159mm from the power supply side to the motor mount and 88mm from the motor mount to the control board side. Will let you know when it's done. haha dang man I am sorry... you are not obligated to do it ;) If you want to send the files over I can try to do it myself but I only have sketchup to work with right now. It will be no big in making the changes. ETA Friday. haha I totally agree.. 4mm is ridiculous. I really appreciate you taking the time to make these and offer them up to the community. It is because of people like you that I am able to have a great printer at an affordable price. Please make a picture so I can see exactly where the spacer touches the brace. Then I can make the modification. Seems a bit off for some reason. This will still insure full function of the brace! Thanks for posting these front and rear braces saved me the time and effort of repeating good work already done. Hi. Download and print, but is too small of the picture. I don t know why. Please describe what you did to correct it so others won't do the same mistake. OK, I thought it would be clear that prints are always set to 100% and that some bigger objects need to be rotated. Summery text updated for those who need the info. Hi, das Teil passt sehr gut. Leider fehlt ein Hohlraum für das Kabel. Eine kleine Aussparung würde sicher schon reichen. Das freut mich. Ich habe kein Kabel das in der Nähe des Teils durch muss. Schick mir doch ein Bild (removed) damit ich weis was Du meinst.